We have all read stories about people tweaking their diesel engined vehicles to run on various bio fuels, deep frying oil being the most used. The Indy Racing League is for the first time running Ethanol, so it is no stretch of the imagination, that some of the other racing series and events would see an influx of bio-fuels. 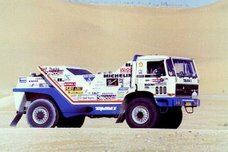 Ukyo Katayama, a former Formula One driver, entered the 2007 Dakar driving a Toyota Landcruiser, running on used Tempura oil. The model is a nice simple model, nothing that will trip up anyone. Enjoy, and maybe next time you are at a Japanese restaurant, and you order Tempura, the oil used might just power a race car.